DRAMMwater offers complete pond aeration systems designed to eliminate algae, reduce particulate, combat pathogens and provide much needed oxygen to ponds. Using a specialized micro-diffusion aeration system to gently turn the water in the pond, we can reduce algae without too much turbulence that often results in high turbidity. Because every pond is different, we custom engineer each system to provide optimal benefit. In addition to climate and geography information, we take a water sample to ensure we are treating any issues present. Dramm will work with you to define the shape, slope and depth of your pond and then engineer an aeration solution to maximize homogenization of the water in the pond. 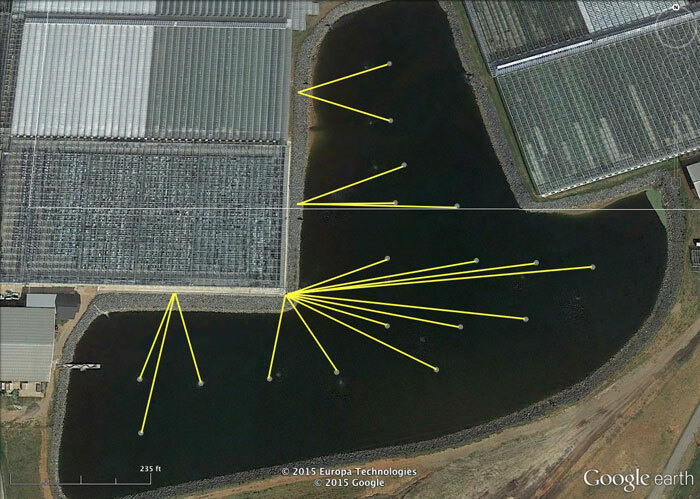 In addition to a comprehensive quote, Dramm will provide a layout of your pond showing placement of disks and airlines. For more information please review our Pond Aeration Brochure or contact us via the numbers to the left or by email with questions.